BABYLON, Long Island (WABC) -- A 76-year-old Long Island woman is recovering in the hospital after being hit by an alleged drunk driver while leaving church Saturday evening. Nancy Ruf, of West Babylon, was walking out of St. Joseph Roman Catholic Church in Babylon around 7:25 p.m. when a police say a car driven by 27-year-old Anthony Parrinello slammed into her. Authorities say Parrinello was driving a 2005 Ford F-250 southbound on North Carll Avenue in front of St. Joseph's. His vehicle struck a parked 2011 Nissan Pathfinder and continued onto the church walkway, striking Ruf, who was among a large number of people leaving the church after having attended Mass. 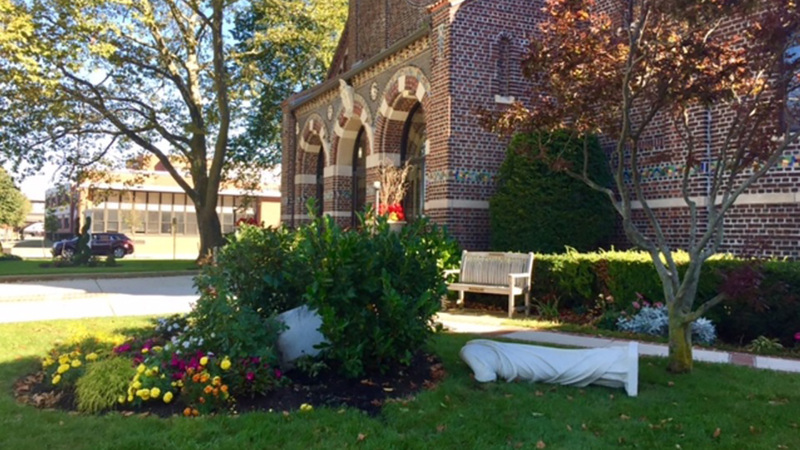 The vehicle continued southbound, striking and knocking down a statue before coming to a stop in front of St. Joseph's Nursery School. Ruf was transported by Babylon Rescue Squad ambulance to Good Samaritan Hospital Medical Center in West Islip for treatment of serious injuries. She is now listed in stable condition. Police arrested Parrinello, of Babylon, and charged him with DWI. He was not injured in the crash. Michael Pepe, 40, and 3-year-old Harper Pepe, both of Babylon, were occupants of the parked Nissan. They were transported by Babylon Rescue Squad ambulance to Good Samaritan for treatment of minor injuries. Parrinello was arraigned Sunday. The judge set bail at $20,000. Police are still investigating the incident and are looking for any cellphone video that may have captured the crash. Anyone with video should call the First Squad at 631-854-8152.